In November 2017, we applied to a call for art celebrating the 50th anniversary of the Oakland Athletics in Oakland. The Oakland A's were looking for local artists to design and paint 50 life-size statues of their mascot, Stomper. We created and submitted a design called, 'Pacific Slugger,' that included a tattoo design Jack created, channelling his Polynesian roots. Pacific Slugger is inspired by the Pacific Ocean and how it connects Oakland to the South Pacific islands, creating shared communities and experiences. Pacific Slugger is dressed for the ocean and adorned with an Oakland A’s tattoo inspired by the traditions of Pacific cultures. In January, we found out we were selected to bring this design to life. A few weeks later, the A's delivery team brought us our 6 foot tall Stomper statue. The unpainted statue was a hilarious addition to our patio. Our first collaborative paintings together included elephants, so it was fun to have an elephant theme for this collaborative project. Rickey Henderson was our landlord in the first apartment we rented together which was another fun connection. We already had the design solidified, so once we had the statue, we just had to apply our design. We created a stop motion video of our process, that includes regular appearances from Zoey and our kava mix. To recreate Jack's tattoo design identically on the front and back of our statue, we used a projector and pencil to get the outline. Then we used small brushes to paint in the black. 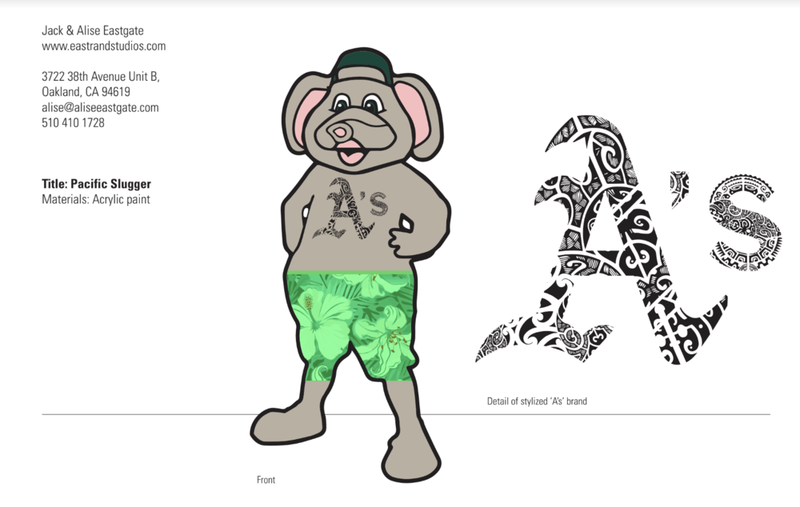 We free-handed the floral design on Stomper's shorts and the "A's" on his cap. The Stomper in the Town team varnished all of the statues before installing them at different Oakland businesses. Here's a map of all 50 statues and their locations. Check out our Pacific Slugger in person at Mad Oak Bar at 135 12th St, Oakland, CA 94607!